So when I saw an instagram post by a friend who snapped pics of them topped with uni– I gasped! It was brilliant and I just had to make them for our Japanese themed Fam Din. Using the gorgeous oysters we nabbed from Dry Dock Fish Co., I put together a simple mignonette with Asian flavors that provided the right amount of acidity and heat to the briny shellfish. 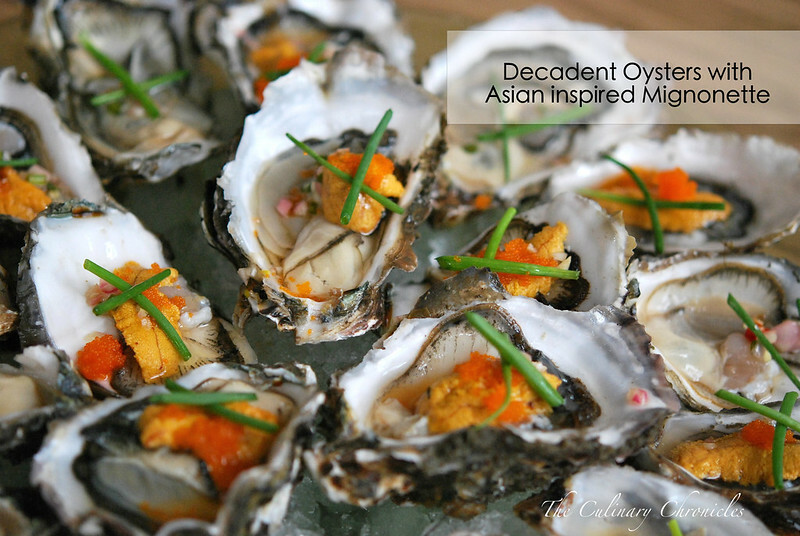 Topped with an unctuous piece of uni and dollop of tobiko, these oysters brought decadence and indulgence to a whole new level! Prepare the mignonette by whisking together all the ingredients until combined. Chill until ready for use. Fill a large platter with ice. Lay the oysters on top of the ice and drizzle each with some of the mignonette. Lay pieces of uni on top of each oyster and top with a small dollop of tobiko. Garnish with the chives and serve immediately. Previous Post Japanese themed Family Dinner and Lychee Saketinis! Kampai! 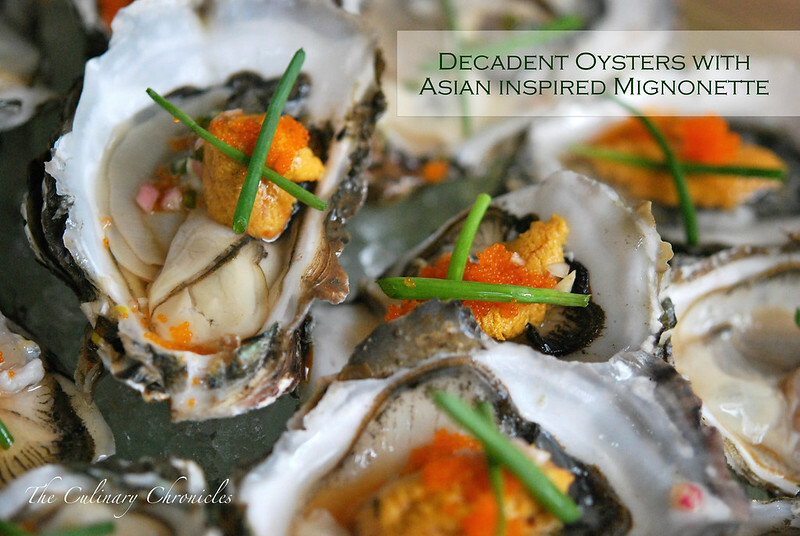 Among all seafood I never really enjoyed oysters, even from famous oyster region in Japan…. I don’t know why. However, my husband is a HUGE oyster and uni fan. He was next to me and immediately realized your pictures with oysters and uni. LOL. He’s jealous!